With over 30 years in the real estate field, Nancy is a dedicated professional who brings expertise in negotiating, finance, and in depth knowledge of the metroplex. Nancy has been a licensed REALTOR® for over 30 years and also has experience as an accredited appraiser and as a loan officer. Nancy has paved the road to success for The Croney Team with her enthusiasm and attention to detail. She enjoys working with people, solving problems and is an expert in finding creative solutions to seemingly insurmountable problems. Hundreds of hours of continuing education have helped her hone her skills and to become an expert at navigating the ever-changing real estate market. Nancy has been married for over 35 years and has two grown children. Her daughter, Jocelyn Sandruck, is a partner in the business. Nancy's clients rely on her to go beyond the real estate transaction, and Nancy helps them with all of their real estate needs for years to come. 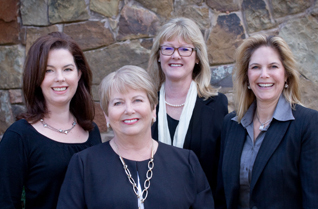 The Croney Team's motto is "Our family helping yours"...and their clients become part of the family! In her personal time, Nancy enjoys gardening, entertaining friends and family, traveling and reading. She also volunteers in community outreach programs and is active in her church. Before becoming a REALTOR®, Jocelyn was The Croney Team's office manager, where she learned the intricate behind-the-scenes processes that are necessary for a smooth real estate transaction, as well as the marketing techniques and technology that are most successful in selling a home. Jocelyn holds a degree in Business Management which is an asset to both The Croney Team and her clients. Her technical savvy and business acumen allow her to help her clients make sound financial decisions. She is also profoundly sincere, helping her clients personalize the search for their new home, and walking them through the decision making process based on their own criteria. Jocelyn lives in Colleyville and is married with two young sons. She is also an active member of the Grapevine Colleyville Southlake Mom's League. She and her husband enjoy renovating their home and playing with their kids. Tina is the Croney Team's buyers specialist. She considers herself a matchmaker trying to find the perfect home for her clients. Although her focus is primarily in North Tarrant and Dallas County, she is comfortable anywhere having lived over 30 years in the DFW metroplex. Tina comes from a teaching background and brings the interpersonal, organizational and research skills of an educator to real estate. Enthusiasm, good communication and personal service are what she strives for. A University of Texas at Austin alumni, she loves all forms of travel, gardening, reading and volunteering, primarily at GRACE. Donna comes to The Croney Team from a strong customer service background. She worked closely with the administrators of the Good Shepherd Catholic Church for many years and because of her excellent organizational skills and attitude, she was a proven asset by engaging attendees and other groups to the achievement of their goals. Prior to working for the church, Donna led a large team of customer service reps in the private jet ownership sector. Donna has been married to her husband Chris for 21 years and they have two children. Since one is in high school and one in college, they feel this is the best time for Donna to pursue real estate and direct her energies to helping others. The real estate field has always intrigued Donna is confident that she will become proficient at coupling her customer service background with her love of real estate to help clients through their journey to find the home of their dreams. Kathy has been working in residential real estate for the past nineteen years. She has experience in listing and selling and enjoys working with first time home buyers. Kathy has expertise in the Fort Worth and Mid-Cities market areas. She recently made the decision to transition roles from residential sales to a real estate assistant so that she could semi-retire and have more time to concentrate on her family. Kathy knows the business inside and out and loves to use her knowledge and expertise to help others succeed. She is a huge asset to our company and she works behind the scenes to ensure that all of our clients receive exceptional customer service and to make certain all of our real estate transactions run smoothly.